Laurel Crown started in 1990 by selling the classic Chippendale chair with ball and claw feet sturdily constructed with mortise and tenon joinery and made from solid mahogany wood. Over two decades later we have expanded our line of Chippendale furniture reproductions to include every room, and it's still our most popular furniture style. Browse our selection! One of the most influential cabinet makers and designers of the 18th century was Thomas Chippendale. With the publication of his innovative designs in The Gentleman and Cabinet Maker's Director, he displayed his mastery of cabinetmaking and his stunning sense of artistry which changed the face of furniture forever. Even all these years later, Chippendale furniture is still revered and beloved for its striking visual appeal and implied elegance. Adding even one element of the famed designer's style to a room can instantly transpose an air of refined taste and elevation. Laurel Crown offers Chippendale furniture covering every room of the home. 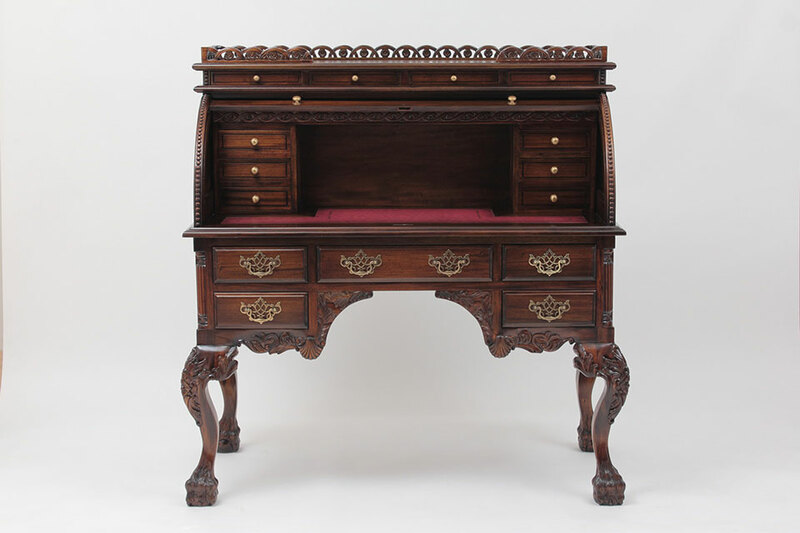 Choose from our reproduction desks for the home office; our beds, dressers, and nightstands for the bedroom; and our tables and chairs for the dining room; all carefully detailed and lovingly made after the original antique designs. From the beautiful neoclassical hand carved embellishments such as leaves or shells to the graceful Georgian curves and scrolls, every replica we offer has been made with the spirit of the original antique in mind. Choose from such Chippendale furniture design staples as cabriole legs and claw-and-ball feet for nearly any room in the home. We offer various lengths, heights, and widths in most categories to ensure you find a replica that is perfect for your space and needs. All of our Chippendale reproductions are carved from solid Honduran mahogany. This type of wood offers stunning beauty in a variety of rich tones and grain patterns, as well as long-lasting quality built to last for many years. While the natural beauty of the wood combined with our semi-satin gloss finish offers an authentic look most will find attractive, our customization department can make adjustments to most replicas to ensure you find the piece that is perfect for your home. Whether in search of an upholstered bench for the foot of the bed, a stunning highboy dresser with maximum storage potential, or a large dining room table of exquisite elegance, our collection of Chippendale replicas has something for every desire. If you have any questions about our reproductions or customizations, our team of furniture experts would be happy to assist you further. Call or order online today to add the beauty of antique furniture to your home!